A Baitfish License is Required to Sell Baitfish in NY. Waters where the use of baitfish is prohibited can be found on the Special Regulations by County pages. The following baitfish are the only species that can be purchased and used in any water body in New York where it is legal to use fish as bait. These baitfish are commonly used throughout New York and are not considered to be a threat to other native New York fish species (except for trout in waters where baitfish use is prohibited). Limiting the use of baitfish to the “Green List” will help prevent the accidental introduction of unwanted species. In addition to the “Green List,” the following baitfish may be purchased and used in specified waters and their tributaries to the first impassable barrier only. They are not included on the “Green List” for a variety of reasons including potential negative impacts on native fish populations (i.e., alewife predation on walleye fry) or they are Marine District species. Alewife: Canandaigua Lake; Canadice Lake; Cannonsville Reservoir; Cayuga Lake; Cayuta Lake; Conesus Lake; Hemlock Lake; Waneta Lake; Hudson River downstream from Lock C-4 and its associated dam in Stillwater to the Battery at the southern tip of Manhattan Island; Keuka Lake; Otsego Lake; Otisco Lake; Owasco Lake; Lake Ontario; Lake Erie; Lamoka Lake; Pepacton Reservoir; Seneca Lake; St. Lawrence River; Niagara River; Mohawk River, and all waters in Dutchess, Orange, Putnam, Rockland, Sullivan, Ulster and Westchester counties. Rainbow smelt: Canadice Lake; Canandaigua Lake; Cayuga Lake; Cayuta Lake; Conesus Lake; First, Second, Third, Fourth, and Fifth lakes of the Fulton Chain; Hemlock Lake; Honeoye Lake; Keuka Lake; Lake Champlain; Lamoka Lake; Lake Ontario; Lake Erie; Owasco Lake; Seneca Lake; Star Lake (St. Lawrence County); Waneta Lake; the St. Lawrence River; and the Niagara River. Mummichog: Hudson River and tidal portion of Hudson River tributaries downstream of the Federal Dam at Troy; and all waters in Nassau and Suffolk counties. Blueback herring and Atlantic menhaden: Hudson River downstream from Lock C-4 and its associated dam in Stillwater to the Battery at the southern tip of Manhattan Island; and the Mohawk River and tributaries to the first barrier impassable by fish. American eel: Delaware River and tributaries to the first barrier impassable by fish, 9-inch minimum size limit; and the Hudson River downstream from the Federal Dam at Troy to the Battery at the southern tip of Manhattan Island, between 9 and 14 inches. Certified baitfish are those that have been tested and found to be free of specified diseases. Use of certified baitfish helps prevent the spread of fish diseases. Certified baitfish purchased from a bait dealer can be transported overland in a motorized vehicle and used in any water body where it is legal to do so. the number of each species sold. The buyer must retain that receipt while in possession of the baitfish. Baitfish without a receipt or with a receipt that is older than 10 days shall be considered uncertified bait. Uncertified baitfish are those that have not been tested to verify that they are free of specified diseases. These uncertified fish may carry diseases that could be harmful to native fish species. Uncertified baitfish purchased from a bait dealer can only be used on the same body of water that they were collected in. Uncertified baitfish cannot be transported overland by a motorized vehicle (e.q., car) except within a designated overland transportation corridor (Baitfish Regulations). The seller of uncertified baitfish outside of an overland transportation corridor is required to provide the same receipt information as for certified baitfish and also include the name of the water body in which the uncertified bait fish can be used and a warning to the purchaser that the baitfish may not be transported overland by motorized vehicle. Any person who has a fishing license1 or is entitled to fish without a license may collect2 minnows (except carp and goldfish), killifish, mudminnows, darters, sticklebacks, stonecats, smelt, alewives and suckers for personal use in hook and line fishing only (sale prohibited) by angling and with the gear types listed below. All other species must be immediately returned to the water. Special regulations associated with personally harvesting alewife and blueback herring in the Hudson River can be found on Tidal Hudson River Regulations. Baitfish or other legally taken fish species intended to be used as bait may only be used in the same water body (Definitions) from which they were caught for bait in hook-and-line fishing. These fish may only be used in a water body where it is legal to use fish as bait. Transportation of personally harvested baitfish overland by a motorized vehicle is prohibited except within a designated overland transportation corridor (Baitfish Regulations). See exceptions on General Regulations for smelt, suckers, alewives and blueback herring taken for human consumption. Possession or use of minnow traps and nets is prohibited on units of state land/waters where the use or possession of baitfish is prohibited (see Special Regulations by County). In the Hudson River downstream of the Troy Dam and in Lake Champlain, Upper and Lower Saranac Lakes, Lake Clear (Franklin Co.), Chazy Lake and their tributaries to the first barrier, smelt may be taken only by angling. Carp, goldfish, lamprey larvae, round goby, as well as species listed as endangered or threatened in New York State may not be used for bait. Baitfish collected in the Marine and Coastal District may be transported overland only for use in the Marine and Coastal District in the following counties: Queens, Kings, Richmond, New York, Bronx, Suffolk, Nassau, Rockland and Westchester. The Marine and Coastal District includes waters of the Atlantic Ocean within 3 miles of the coastline and all other tidal waters, including the Hudson River upstream to the Mario M. Cuomo Bridge. Any dead fish, or parts thereof excluding eggs, that are legal to possess and are not prohibited for use as bait (see above) that have been packaged for commercial sale and have been preserved by methods other than by freezing only (e.q., salted minnows) can be used in any water body where it is legal to use fish as bait and do not require a receipt. Each package of dead bait fish must be individually labeled, identifying the name of the packager/processor, the name of the species, the quantity of fish contained, and the means of preservation. Three defined overland transportation corridors were designated for the purposes of allowing the transport and use of uncertified baitfish by anglers in specific areas of the state. The three overland transportation corridors are intended to primarily serve anglers fishing three major water bodies: the Lake Erie-Upper Niagara River; the Lower Niagara River-Lake Ontario-St. Lawrence River; and the Tidal Hudson River. To protect against the spread of fish diseases into uninfected waters through the use of baitfish, uncertified baitfish are only allowed to be used on the same body of water where they were collected within these corridors. Uncertified baitfish purchased from a bait dealer may be transported within a designated overland transportation corridor provided a receipt, issued by the seller and retained by the purchaser while in possession of the baitfish, contains (1) the seller’s name, (2) date of sale, (3) the species of fish, (4) the number of each species sold, (5) the water body the baitfish must be used in, (6) the overland transportation corridor the baitfish must be transported within, and (7) a warning that the baitfish may only be transported within that overland transportation corridor. Personally collected baitfish taken from a water body within an overland transportation corridor may be transported within that corridor. These baitfish may only be used in the same water body (Definitions) they were collected in. Baitfish are a very effective and commonly used form of live bait for a variety of fish species. However, the careless use and disposal of bait fish can have a dramatic impact on native fish populations. Populations of fish such as brook trout that have evolved with few, if any, competitive fish species and rarely feed on fish, have been destroyed by the introduction of baitfish or other non-native fish species. Anglers should also be cautious with how they dispose of the water that the bait fish are contained in. This water could contain aquatic invasive species such as larval zebra mussels or water fleas, as well as fish diseases. These species can be introduced into another waterbody if bait water is dumped into it. Help us protect New York’s waters from damaging fish diseases, aquatic invasive species and non-native fish. USE baitfish only in waters where their use is permitted. ONLY use bait purchased from a dealer selling certified disease-free bait. DON’T move bait or other fish from one water to another. DUMP unused bait in the trash or other receptacle, or in an appropriate location on dry land. Introduction of fish species, including the dumping of unused baitfish, into a water body without a DEC stocking permit is a violation of Environmental Conservation Law. NEVER dump bait water into a waterbody. If you need to replace the water in your bait bucket, first drain the existing water on dry land. If you intend to place bait fish into a boat’s bait well, replace the water they are being held in with water from the waterbody you will be fishing in prior to dumping them into the bait well. Keep Fishing Great in New York State! The use or possession of fish as bait is prohibited on many trout waters and on certain units of state land (listed in Special Regulations by County. These restrictions are necessary to preserve trout fishing and maintain native fish communities. Baitfish can become established if they escape from a bait pail or get off a hook alive. Natural reproduction of trout can be severely reduced or eliminated by competing fish. Aquatic insects and other food items are less available to trout in the presence of competitors. The result is a rapid and dramatic decline in the total weight of trout in a pond after competing fishes become established. Canadice, Canandaigua, Cayuga, Hemlock, Keuka, Owasco, Otisco and Seneca lakes. Stunning may be used to collect stonecats. Stunning means tapping a stone with an implement or other stone. 1 Recreational marine fishing registration is required to collect alewives, blueback herring or smelt from the Hudson River below the Troy Dam, including tributaries to the first barrier impassable by fish. 2 Possession of endangered or threatened fish species is prohibited. 3 The only place where cast nets may be used is in the Hudson River below the Troy Dam. and used as bait counts toward your daily limit. 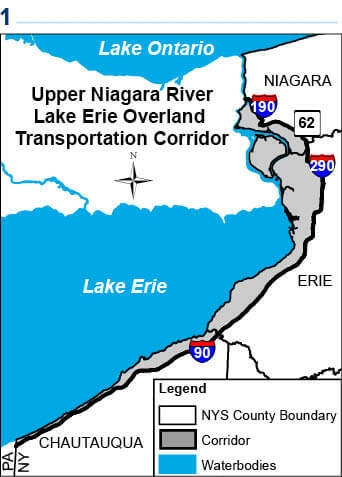 Upper Niagara River/Lake Erie Overland Transportation Corridor shall mean the geographical area associated with the New York portion of Lake Erie and the Upper Niagara River west of and including a line starting at I-90 at the Pennsylvania border, then continuing east to its intersection with I-290, then continuing north along I-290 to its intersection with State Route 62, then continuing west to its intersection with I-190, then north to its intersection with the Lower Niagara River. Baitfish collected from the New York portion of the Upper Niagara River/Lake Erie water body may be transported within this corridor. Hudson River Overland Transportation Corridor shall mean the geographical area associated with the Hudson River south of the Federal Dam at Troy starting at the eastern shore of the Hudson River at the Federal Dam in Troy, continuing east on W. Glenn Avenue in Troy to its intersection with State Route 4, then continuing south on State Route 4 to its intersection with State Routes 9 & 20, then continuing easterly to its intersection with State Route 9, then continuing east on State Route 82, to its intersection with the Taconic State Parkway, then continuing south on the Taconic State Parkway to its intersection with the Sprain Brook Parkway, then continuing south on the Sprain Brook Parkway to its intersection with I-287, then continuing west on I-287 across the Mario M. Cuomo Bridge to I-87 North, then continuing north on I-87 to where State Route 9W crosses I-87 in Greene County, then continuing north on State Route 9W to where State Route 9W crosses I-87 in Albany County, then continuing north on I-87 to its intersection with State Route 7, then continuing east on State Route 7 to its intersection with I-787, then continuing north on I-787 to its intersection with Tibbets Avenue, then continuing east on Tibbets Avenue to its intersection with Delaware Avenue, then proceeding in a straight line to the west edge of the Troy Dam. 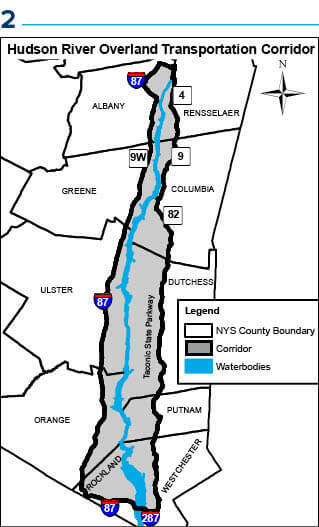 Baitfish collected from the New York portion of the Tidal Hudson River water body may be transported within this corridor. Lower Niagara River/Lake Ontario/St. Lawrence River Overland Transportation Corridor shall mean the geographical area associated with New York portion of the Lower Niagara River, Lake Ontario and the St. Lawrence River starting at the intersection of I-190 and the Lower Niagara River, then continuing eastward to its intersection with State Route 104, then continuing eastward to its intersection with State Route 3, then continuing east on State Route 3 to its intersection with State Route 104, then continuing eastward on State Route 104 to its intersection with State Route 11, then continuing north on State Route 11 to its intersection with State Route 56, then continuing north along State Route 56 to its intersection with State Route 37, then continuing east along State Route 37 to its intersection with Racquette Point Road, then continuing north on Racquette Point Road to its intersection with Ransom Road, and then continuing west on Ransom Road and terminating at the St. Lawrence River. Baitfish collected from the New York portion of the Lower Niagara River/Lake Ontario/St. Lawrence River water body may be transported within this corridor. For full page maps of the transportation corridors, see above.